On July 27, 2012, the final relay runner delivered the flame of Olympia to Olympic Stadium in London, inaugurating the 2012 Summer Games Opening Ceremony. The 8,000-plus golden metal torches used during the relay—each has 8,000 holes, representing the 8,000 torchbearers who carried the flame 8,000 miles over 70 days—have become instant collectibles. In fact, Olympic relay torches are among the rarest and most desirable of all Olympics collectibles; some have brought six figures at auction. But the demand for the new 2012 torches is unprecedented. 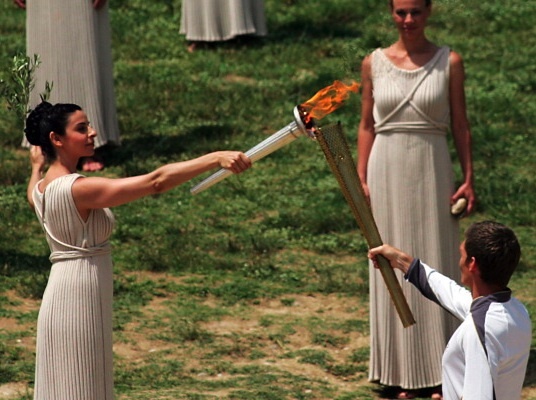 British-born Greek swimmer Spyros Gianniotis received the flame for the 2012 London Games from the high priestess in Olympia, Greece, on May 10. Via InsidetheGames.biz. 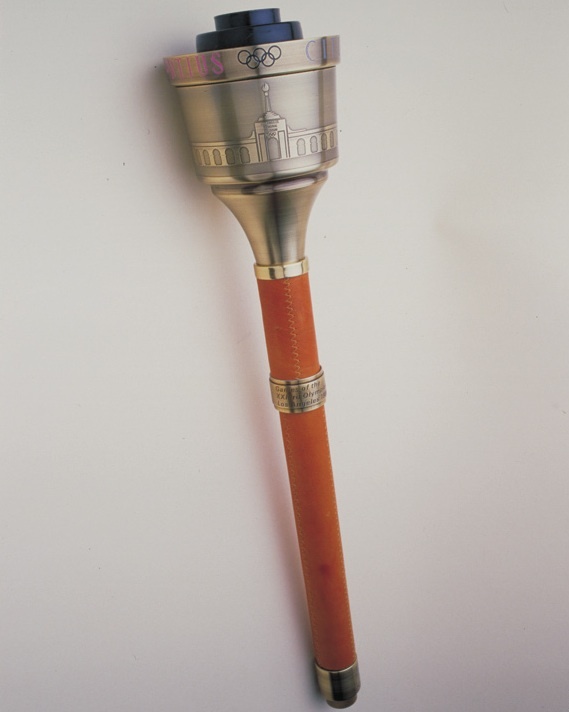 One of 22 torches made for the 1952 Helsinki Summer Games sold for nearly $400,000 at auction last year. Copyright International Olympic Committee. Those collectors may want to check their math. 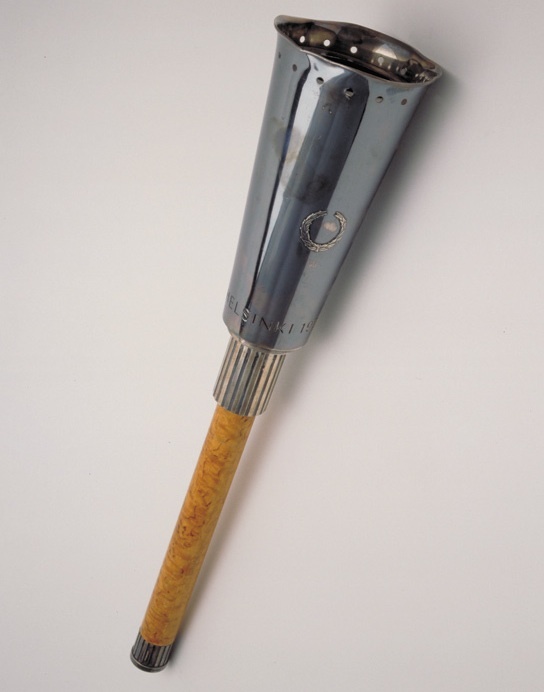 After all, one of the torches made for the 1952 Helsinki Summer Games sold for nearly $400,000 last year at auction in Paris, currently the second most expensive Olympic item ever sold, but there were only 22 made versus 8,000 in London. The more common torches, like the 17,000 torches made for the 1996 Atlanta Summer Games torch, go for a couple thousand dollars online. 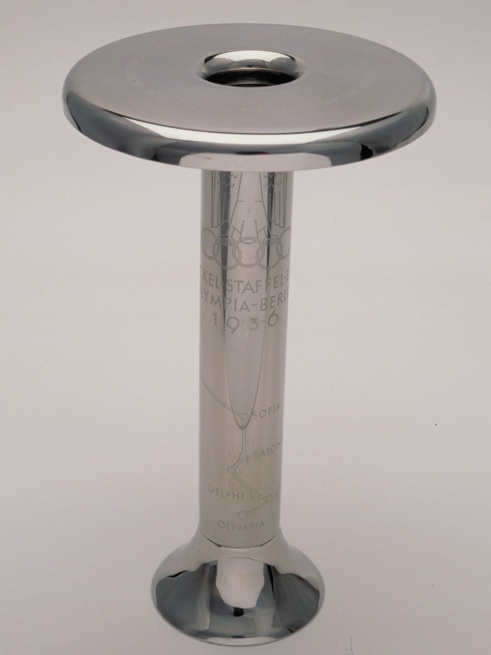 The 1956 Melbourne torch, based on the classic 1948 London lamp torch, dropped burning debris on the final runner. Copyright International Olympic Committee. Perlow’s silver-and-copper Salt Lake Olympic torch—one of more than 12,000—is shaped like an icicle, and the flame, symbolizing the “fire within” each runner, was contained in frosted glass at the top. Perlow, an Atlanta-area hospital volunteer, was selected for the relay by event sponsor Coca-Cola. The soda company also hired him as the coordinator for its Olympic pin-trading center in downtown Salt Lake City during the Games. Olympic memorabilia collector Craig Perlow had the honor of bearing this “fire and ice” themed torch for the 2002 Salt Lake City Winter Games. Copyright International Olympic Committee. The 1998 Nagano torch, with its handle wrapped in yellow thread, was based on a traditional Japanese torch. 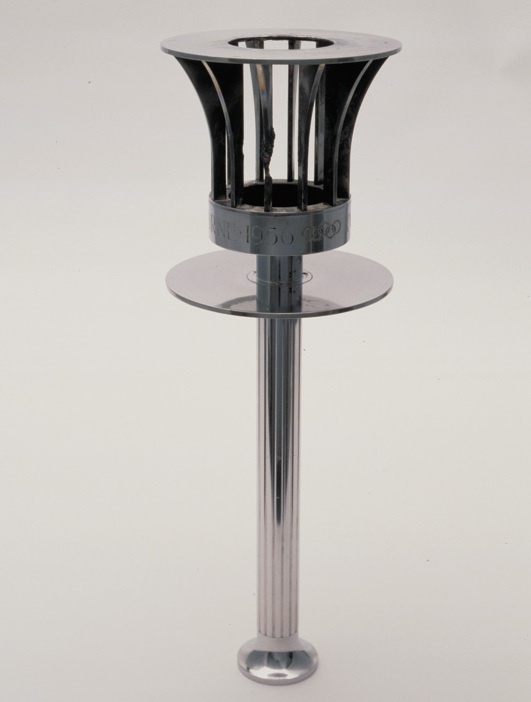 The 1992 Barcelona torch, created by industrial designer André Ricard, was part of the Games’ overarching design scheme. Copyright International Olympic Committee. Most of the recent torches, from the ’80s onward, come to the market through torchbearers like Perlow. The torchbearers are either selected by that Olympics’ organizing committee, or the relay’s corporate sponsors—in the case of the 2002 Salt Lake City Games, it was Coca-Cola and Chevrolet. According to Perlow, Coke gave the torches to the bearers; Chevy charged the bearers who wanted to keep their torches, something along the lines of $300-$400 a piece. The modern torch relay originated at the 1936 Berlin Olympics, in Nazi-era Germany. Copyright International Olympic Committee. The continually burning flame has its origins in the ancient Grecian Olympics, but the fiery cauldron didn’t return to the modern-day Olympics until the 1928 Amsterdam games. The concept of the torch relay, was introduced in 1936 by Carl Diem, Germany’s sports minister under Adolf Hitler’s Nazi regime, when the Olympics were held in Berlin. World War II cancelled the 1940 and 1944 Games, interrupting the Olympics for 12 years. When the event returned to London in 1948, archaeologist Ralph Lavers based his torch design on ancient Greek and Roman lamps. This classic lamp shape was echoed for the 1956 Cortina d’Ampezzo Winter Games, the 1956 Melbourne Summer Games, and the 1960 Squaw Valley Winter Games. 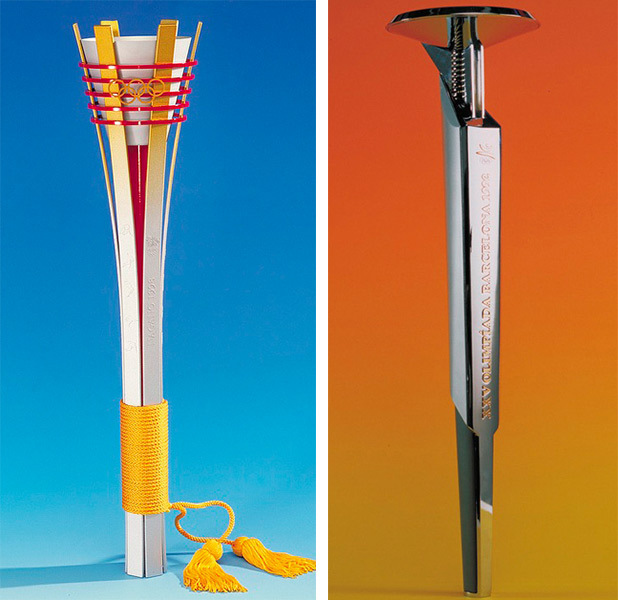 Starting with the 1964 Tokyo Games, many ’60s and ’70s torches resembled simple sword-like tubes, until the 1984 Los Angeles Summer Games brought the lamp-style back. Disney artist John Hench created a special 3-D design for the 1960 Squaw Valley torch. Copyright International Olympic Committee. The Squaw Valley torch, created by Disney artist John Hench, was decorated with the Olympic rings and three superimposed triangles—red, white, and blue—which overlap to create a 3-D image of a star, representing America. 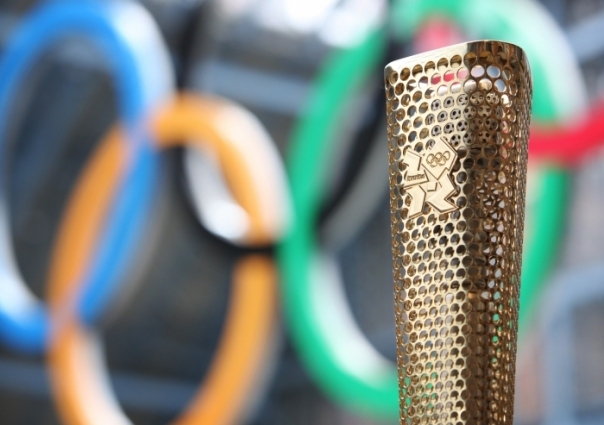 This level of conceptual design became the standard for all successive torches, which incorporate elements to represent both the host country and the Olympics’ theme. Mechanically speaking, every torch has to contain fuel, a system to deliver the fuel to the torch top, and an aerodynamic shape that is safe and easy to carry. Usually, the torches are between 3 and 4 pounds, and designed to burn brightly in all sorts of extreme weather conditions, be it rain, wind, or snow. Torch relays have traversed wide swaths of the planet, which means their lamps and fuel containers have to be designed to keep the flame protected and lit underwater, in airplanes, and even during a skydive. 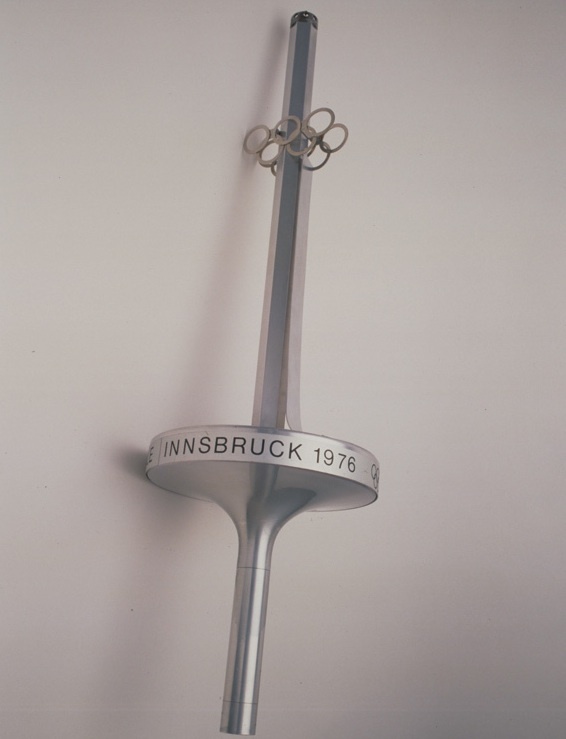 The Olympic rings stand out on the sword-style torch for the 1976 Innsbruck Winter Games. Copyright International Olympic Committee. Since 1936, the Olympic torch designers have experimented with a wide range of fuels and igniting liquids, from gunpowder to olive oil to a mixture of formaldehyde and ammonia. Of course, many early torches were also dangerous. The final torch in the 1956 Melbourne relay, a special torch made of aluminum and lit by magnesium, dropped scorching pieces onto the runner’s arm (starting with the 1972 Munich Games, torches have used much safer liquid fuels). The 1968 Mexico City Summer Games were particularly unusual, in that they had not one, but five distinct torch designs in the relay, for 3,000 torches in total. Some were all metal (aluminum or steel) and others had wood handles. Since the cast-metal proved extremely hot for the bearers to hold, the ’68 all-metal torches had handles wrapped in leather. 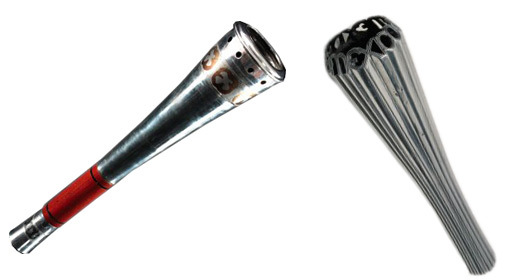 The 1968 Mexico City relay, which followed Christopher Columbus’s journey to the New World, featured five distinct torch designs. Copyright International Olympic Committee. For the 1976 Montreal Summer Games torch relay, some “Star Trek”-style high-tech was put to use. According to OlympicTorchCollection.com, the flame was carried from Olympia to an “ion receiver” in Athens, Greece, where it was converted into electric energy, which was used to produce a sound signal. That code was transmitted to Canada via satellite, where it was converted into a laser beam used to light the torch. American 1984 Olympics organizer Peter Ueberroth created the money-generating corporate-sponsored climate of the Olympics we know today. In fact, the flame didn’t originate in Greece for the 1984 Los Angeles Summer Games, because the Greek contingent of the International Olympic Committee was irked that sponsor AT&T was “selling” the torchbearing honor for a $3,000 donation, an idea that raised $11 million for charity. 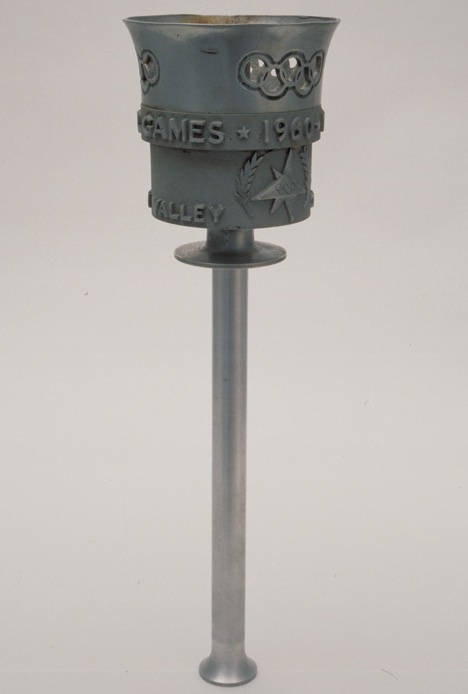 The torch for the 1984 Los Angeles Summer Games went back to classic lamp styling. AT&T sold the torchbearing honor for a $3,000 donation to charity. Copyright International Olympic Committee. In the ’90s, Olympic torches started to abandon classic styles in favor of more modern, architectural, and heavily symbolic shapes. French architect and designer Philippe Starck made the sleek 1992 Albertville Winter torch in the shape of a flame. The long, thin 1994 Lillehammer Winter torch arrived at the Opening Ceremony via ski jumper. The 1996 Atlanta Summer torch, made of 22 aluminum reeds, was inspired by ancient torches using leaves bound by twine, while the silver, red, and yellow 1998 Nagano Winter torch took its futuristic-looking shape from a traditional Japanese torch called a taimatsu. 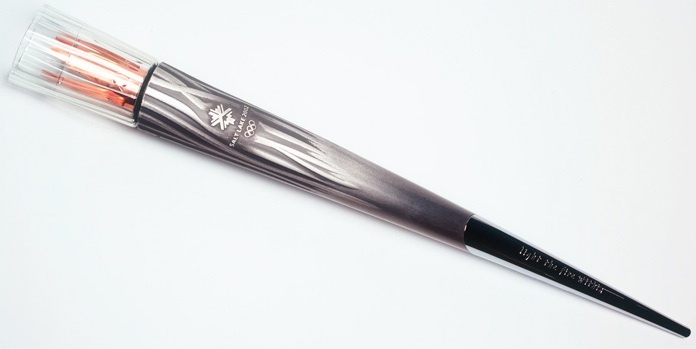 In 2000, the Sydney Summer Games torch was made of streamlined, swooping arcs of white, blue, and silver, representing a boomerang, the Pacific Ocean, and the Sydney Opera House. The flames of the 2004 Athens Summer Games torch appeared to rise out of the bearer’s hand, while the fire of the 2006 Turin Winter Games seemed to consume the body of the torch. 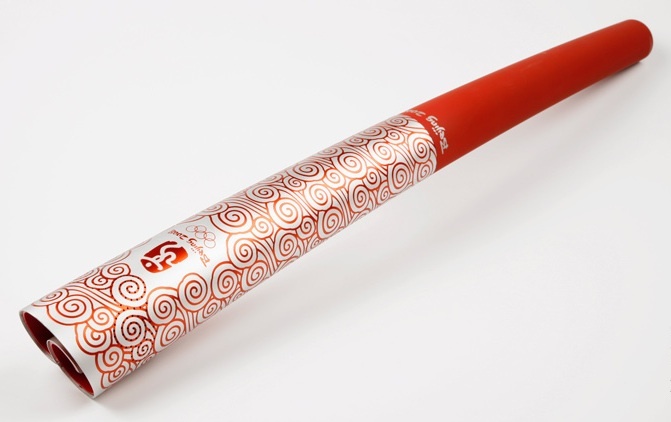 The red and gold 2008 Beijing Summer Games torch was shaped like a curved Chinese scroll, referencing the phoenix and “lucky clouds” in its design. From left, the Olympic Summer Games torches for 2000 Sydney, 1988 Seoul, and 1996 Atlanta. Copyright International Olympic Committee. 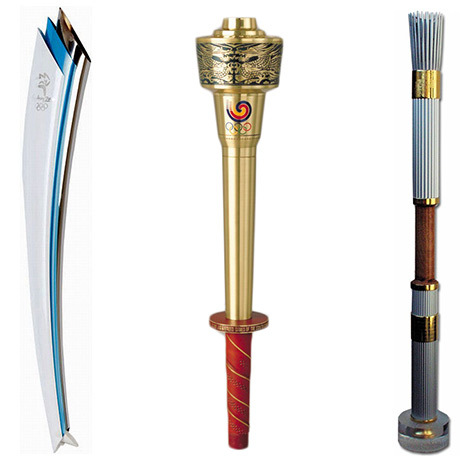 As cool as Olympic torches are, it’s very nearly impossible for ordinary folk to collect ’em all. Avid Olympic collectors are more likely to focus on pins, participation medals, posters, and mascots. While sleek and modern, the 2008 Beijing torch pays homage to Chinese heritage with its scroll shape and “lucky cloud” pattern. Copyright International Olympic Committee. How can I disassemble and reassemble a 1996 Olympic Torch? I have a 1996 torch that still has fuel in it. Does it destroy the value to release the fuel? WE ATTENDED THE OPENING CEREMONY FROM THE 1996 SUMMER OLYMPICS AND HAVE THE PACKAGE OF MATERIALS THAT WERE USED DURING THE CEREMONIES. IS THERE ANY VALUE TO THIS MATERIAL? Friend of mine has the actual Muhamed Ali Olympic torch from the 1996 Olympic Games. Just curious as the Olympic opening ceremony has just finished, how much would that actual torch that was lit by Muhamed Ali to start the flame of the Olympics would be? Also, it is signed both Muhamed Ali and Cassius Clay on torch and is in mint condition in glass display box. I have an Olympic torch Atlanta—it is hanging on the wall using fish tackle. I would be glad to share how I did it. Is there any way you can tell me it’s value?